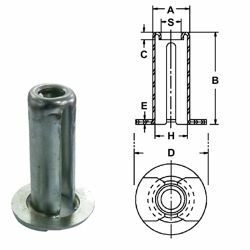 Size |D x B|: 9-0615-16 :: 1-1/2 x 1-7/8" 9-0815-16 :: 2 x 1-7/8" 9-0823-16 :: 2 x 2-7/8"
Select a Size |D x B| in the menu above. Spring retainers can make your stamping die or machine easier to maintain. Retainers can keep die springs in position while a stripper plate or pressure pad is removed for repair. Danly spring retainers are made of stamped sheet metal steel. They can be used with inch or metric die springs. See the solid alloy steel spools listed below if you need to pre-load the springs. The available (use-with) spring diameters (D) are 1-1/2 and 2 inches (38mm and 50mm). The available overall lengths (B) are 1-7/8 and 2-7/8 inches (48mm and 73mm). Please contact us if you need a different size, or if you need us to make any alterations.